Big red arrows, panicking news experts, and the echo chambers of our social media feeds can make stock market volatility seem much worse than it actually is. If you’re having trouble keeping a cool head about your own investments, take a deep breath and consider these three key points about market history and the true purpose of your financial plan. Today’s losses might seem scary, but if you can clear your head of all the noise and stay focused on what’s really important, your investments will yield a greater Return on Life. 1. Stock market declines are normal and expected. In March of 2009, the US markets finally bottomed out at the end of the Great Recession. Since then, investors have enjoyed a nine-year bull market, by some measures the longest ever. You might suspect that after such historic growth, what goes up was bound to come down. And market history tells us that’s exactly the case. 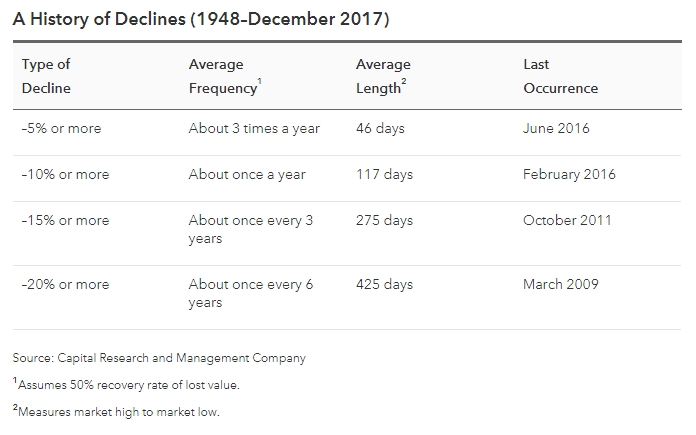 In fact, according to this chart from Capital Research and Management Company, we’re slightly overdue for the approximately 20% decline the markets are experiencing right now. Recency bias convinces many people that this downturn is different, because our current social, political and geo-political environment is being amplified by non-stop news and twitter feeds. But think about some of the things that have happened since the beginning of this chart in 1948: Europe putting itself back together after World War II; the tumult of the 1960s, culminating in the Kennedy assassinations and Vietnam; the gas shortages in the 1970s; the Black Monday market crash in October 1987; two major wars in the Middle East and countless other military engagements; 9/11; natural disasters like Hurricane Katrina and the Indian Ocean Tsunami; the Lehman Bros. bankruptcy and subsequent housing crisis in 2008. Through all these events, and many more, the market experienced short-term declines. But viewed through a wider lens, the long-term trajectory of the stock market has continued to point upward, no matter what the world and panicky investors throw at it. 2. You’re planning for tomorrow, not today. We’re working with you towards long-term goals, including a secure and rewarding retirement and a significant legacy that will benefit your family, friends, and community. The people who are most affected by today’s stock market numbers are people who make a living buying and selling stocks every day. These traders are operating on a timeframe that’s much narrower and much more volatile than the investments in your retirement portfolio. Take the 1987 market crash as an example. Many day traders lost their shirts on Black Monday. But just 23 months later, the market was back at its previous breakeven point. Now, of course, those 23 months were nervous times, especially for folks who were nearing retirement. But viewed over the course of a typical 30-year accumulation period, these kinds of normal market corrections are typically minor blips. 3. Return on Investment is less important than Return on Life. Still, there’s more to your money and the investment strategies you’re working on together with your advisers than just your ROI. Real meaning in life comes from focusing on all the things money can’t buy. If you spend your entire working life chasing after the next cheque, then when you retire, money is all you’ll have. You won’t have a network of personal relationships to enjoy. You won’t have a connection to your community and local causes that improve it. You won’t have a personal routine that keeps you healthy, active, and engaged. You won’t have hobbies that put your skills and interests to their highest uses. You won’t have a spiritual or aesthetic centre you can cultivate through art, nature, religion, or giving back. In retirement, you also won’t have that next cheque to chase anymore because … you’re retired! What are you going to do with all your new free time? Fretting about normal market volatility only leads to bad financial decisions and a distorted view of what your money is really for. We’ve found that the sooner clients start focusing on living the best life possible with the money they have, the greater their Return on Life is throughout the financial planning process. If you’re worried about how this latest market correction could affect your financial plan, let’s arrange a meeting to discuss. We’ll run through our checklists to make sure your plan is on track to deliver something more important than money: a happy, secure, and fulfilling life.